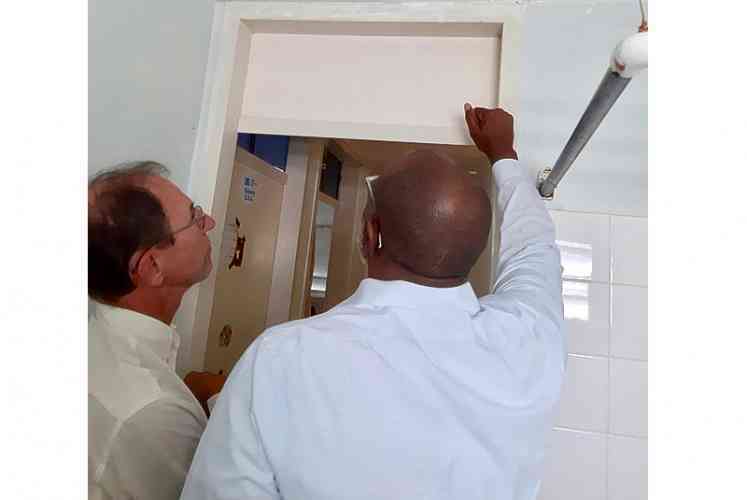 National Recovery Programme Bureau Director Claret Connor recently made supervisory visits to see the repair works at the Belvedere Housing Complex and the Philipsburg and Simpson Bay police stations. The works fall under US $55 million Emergency Recovery Project 1 supported by the Dutch-financed, World Bank-managed St. Maarten Recovery and Resilience Trust Fund. St. Maarten Housing Development Foundation (SMHDF) is overseeing roof and ceiling repairs to the homes of 117 families. Connor, Project Manager Paul Sijssens and SMHDF representatives toured some units and spoke with residents about the work. The police station and substation needed repairs and upgrading to better to withstand future hurricanes. Works include installation of aluminium shutters, electrical wiring, cabinet replacement, light fixtures and ceiling tiles. Here, Connor and Sijssens were accompanied by Police Chief Carl John, the contractor and the supervising company. All agreed verification systems are being adhered at both projects. The works are taking longer than originally anticipated, but it is paramount that works are not just completed fast, but need to adhere to the strict quality standards, said Connor.